Our transcription of the interview can be found here. The comments on San Ramon Express about the interview can be found here. 17. Chris Roberts and Terry McSweeney, NBC Bay Area, "Cemetery Sparks Development Fight Near Danville," February 21, 2013 link to article and video; link to video alone. Interviews with Michele Ulrech (neighbor), Sid Corrie (developer), Ron Brown (Save Mount Diablo). 36. Carlos Barria, Shanghai, in Reuters.com on May 15, 2014: "As attitudes change in China, people look to the sea for burial"
40. City of San Ramon, video of the June 24, 2014 “Presentation and Discussion of the proposed Creekside Memorial Park cemetery in the Tassajara Valley.” This is the official video of the entire meeting and lasts 116 minutes and 11 seconds. 47.The Independent, "Short Notes" section, "Hike Offered," August 8, 2014 Link. 53. Cierra Bailey, DanvilleSanRamon.com Express, “San Ramon residents organize protest against Creekside Memorial Cemetery,” August 18, 2014. 54. Joyce Tsai, ContraCostaTimes.com, “San Ramon: Tassajara cemetery opponents ask City Council to reverse ’05 resolution,” August 19, 2014. 55. Cierra Bailey, Pleasantonweekly.com, “San Ramon residents organize protest against Creekside Memorial Cemetery” August 22, 2014 [note the article is the same as appeared in the DanvilleSanRamon.com Express on August 18, but the reader comments following the article are different. 59. Roz Rogoff's blog "San Ramon Observer" in PleasantonWeekly.com, September 8, 2014, "Answering questions from my last blog on the cemetery"
61. Contra Costa Times, "Lens on the Bay," September 20, 2014, photo with the caption "Consecration for Cemetery"
62. Jeremy Thomas, Contra Costa Times (Valley Journal), October 2, 2014, "Ground broken on Jewish site," page 1 and page 2. 64. 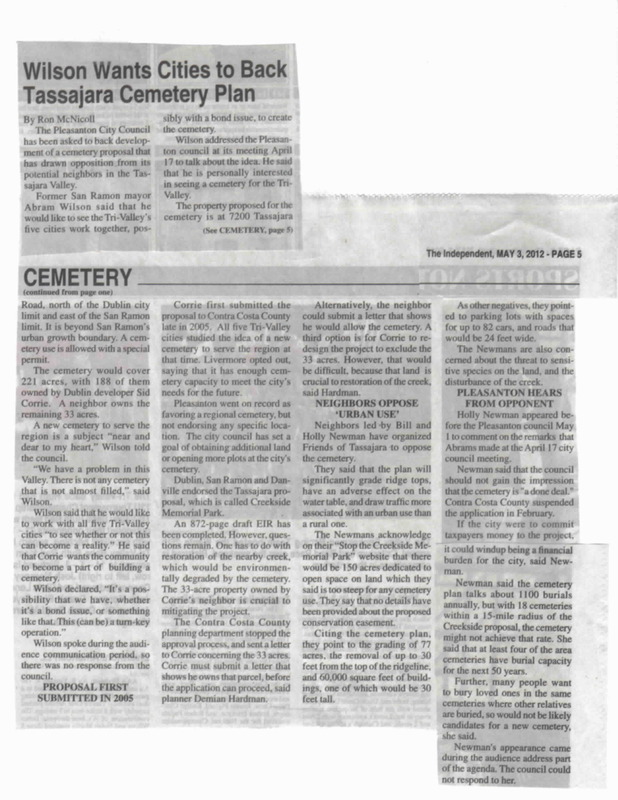 Jeb Bing, PleasantonWeekly.com, October 6, 2014, "Pleasanton commission set to approve plan for city's Pioneer Cemetery"
84. Contra Costa Times: "Veterans cemetery opposed", June 8, 2015. 85. Trulia’s Blog, Real Estate 101, “Trulia’s House of Horrors: The House-Hunting Fears of Men vs. Women”, October 13, 2015. 86. Kathryn Vasel, CNN Money, Real Estate Special Report, “Death can really kill your home value”, February 10, 2016.